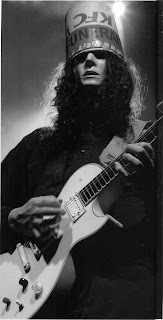 Buckethead was born Brian Carroll in 1969 and, aged 13, moved to Claremont, California where he took guitar lessons from future Mr Big guitarist Paul Gilbert for a year. By the time Zutaut joined the Chinese Democracy project, Buckethead had left, frustrated by what he saw as the band’s inactivity. Axl wanted him back. So Zutaut arranges a meeting with Brian/Bucket at a deli in LA and listens as the guitarist explains why he left: he doesn’t get on with Roy Thomas Baker, he’s frustrated at the whole situation – at coming in to the studio everyday when Axl’s not even there, playing the same parts over and over. Axl’s his hero, he tells him, but he just spent a year going nowhere. He doesn’t think the record will ever come out and he just has to move on with his life. What, Zutaut asked, could he do to make the recording experience better for him? Suddenly, says Zutaut, Brian Carroll was transformed in front of his eyes. “He went into Buckethead mode,” says Tom. “I mean, I was talking to Brian, who was confiding in me, and suddenly he was Buckethead and he was telling me some story about how his parents were chickens and he was a chicken–how his mum was a hen and his dad was a rooster. I couldn’t tell whether it was fantasy or reality or who I was even talking to. But he believed it! Two days later, it was built. “It’s like an apartment within the studio that’s a chicken coop,” says Zutaut. ‘He’s got his chair to record and a little mini sofa in there, and there’s, like, a rubber chicken with its head cut off hanging from the ceiling and body parts. It’s totally Buckethead’s world. It’s like Halloween in the chicken coop: part chicken coop, part horror movie. We built the coop and then he brought in all his props and toys and put straw on the floor. You could almost smell the chickens. Buy the February issue of Classic Rock Magazine to read the entire article. On newstands now. Black Crowes: "Maxim Review is a Fraud"
Bono: "New Album Will Be Radical"
Ace Frehley Confirmed for Sweden Rock! AC/DC - About to Rock - We Salute You! New Loaded Album! This Summer!! And a Tour!! !